"This baked hash brown dish is rich and creamy, and goes great with anything. Good for pot luck, too!" Preheat oven to 350 degrees F (175 degrees C). Lightly grease a 9 x 13 inch baking dish. In a large bowl combine hash browns, potato soup, celery soup, sour cream, salt, pepper, milk, onion and bell pepper; mix well. Spoon into prepared pan and sprinkle with parsley, paprika and cheese. Bake in preheated oven for 1 1/2 to 2 hours. Excellent. 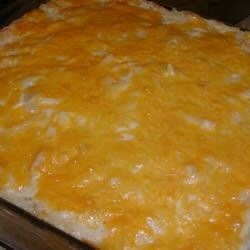 Should try a little cheese in the potato mixture in addition to what is on top. Could probably come out in less time than the recipe calls for. These were good but I have other potato casseroles that I like better.